I was rummaging around in the Tassles archives this morning and came across a bunch of fantastic things I’d forgotten I had. Getting post is ace, and I think this shows that REAL things are much nicer than virtual things sometimes…. Some priceless cheques, courtesy of my Dad’s sense of humour. 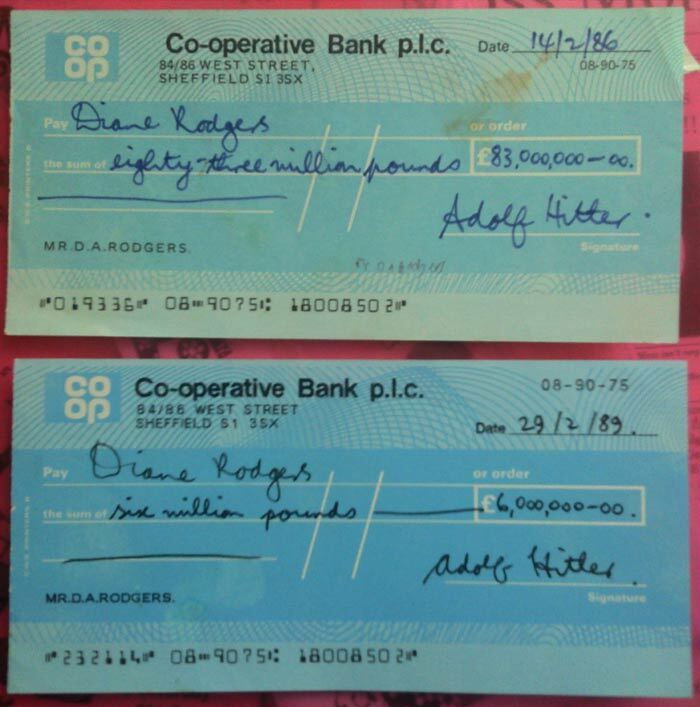 Who knew Hitler banked with the Co-op? Einfach Klasse! Picture that me and Amy Beaumont at school in German classes used to find pretty hilarious (because it’s a German sausage! And it looks like it’s doing a trump! Let’s draw the trump on every textbook we can get our hands on!). She sent me a copy of this a few years ago and it made me smile. 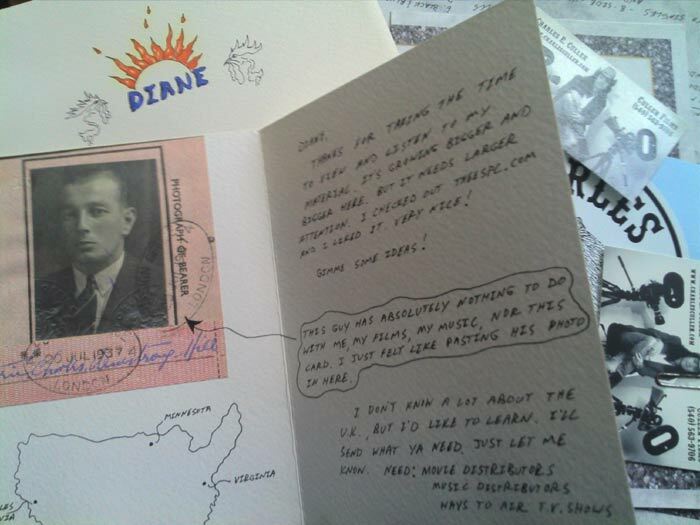 Moss Monthly – I had a friend at school called Claire Moss, who had a great, surreal sense of humour. To the point where I decided to make a fanzine about her. 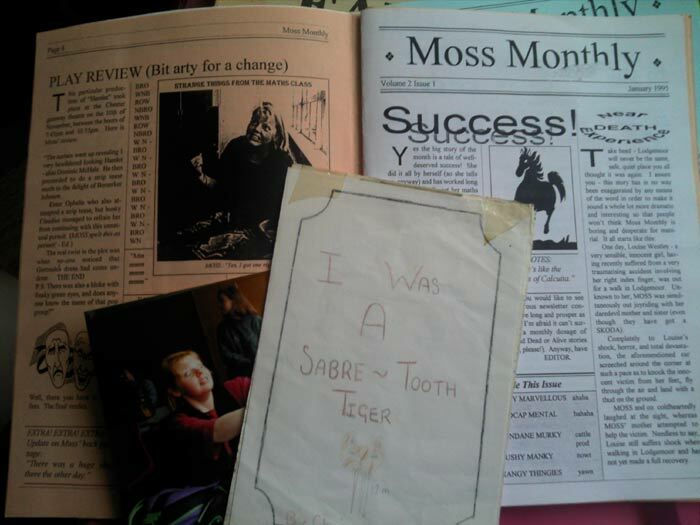 There are quite a few issues of this, and you can see here a short story I got her to write for the mag called ‘I was a sabre-toothed tiger’. Classic literature. Mix tapes! I thought I might have more of these, but this seems to be it! All from about 10 years ago I think. 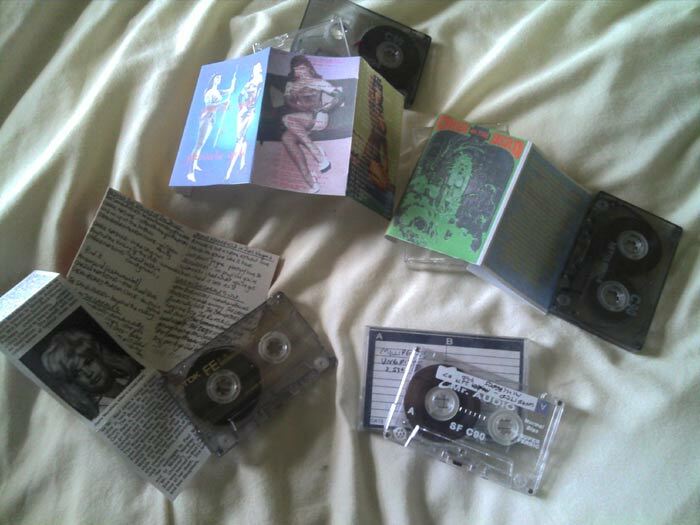 A couple of tapes my friend Mitch gave me with some fantastic rockabilly tunes, another Katherine Jackson kindly made for me with Beyond the Valley of the Dolls soundtrack, Jayne Mansfield live and other bits, and a copy of very early Millipedes recordings Chris Mabbs gave me. Watch with Longarms! Adrian KHLA Flanagan gave me this video – which includes a show KHLA did at the Leadmill where I seem to play a small part in a stage invasion briefly. There is some amazing stuff on here: The Monks, Add N to X’s Metal FIngers in my Body video, Suicide, Gainsbourg, Nomi, Bruch Haack…. thanks Uncle Ade! A bunch of SPC stuff! 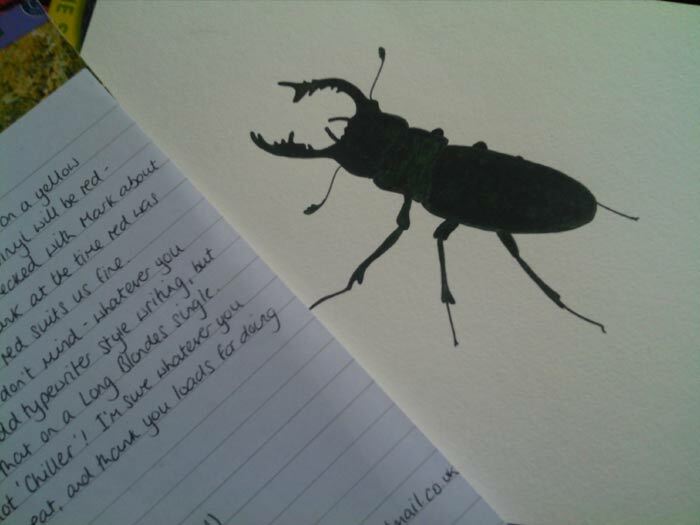 I have a separate folder of Sheffield Phonographic Corporation related memorabilia, but here are a few I just found elsewhere – Nicola Slow Down Tallahassee’s fab original painting of a beetle, which was used on the 7″ record label (I hope she didn’t want it back! ), a ton of cool stuff from Charles Cullen who used to send me ace care packages full of rubber bats and skeletons along with copies of his TV shows, horror films and albums, and also a random SPC flyer I’d done which I’d completely forgotten about! The House of Ill Repute. I didn’t realise I still have a copy of the script of this ultra-low budget film I helped out with many years ago when I worked at Sheffield Independent Film. I recall a pretty funny occasion at the SPC mansion back in the late ’90s at a party, involving a video camera and Markie Velodrome reading amusing sections of the script aloud for the delight of the room. 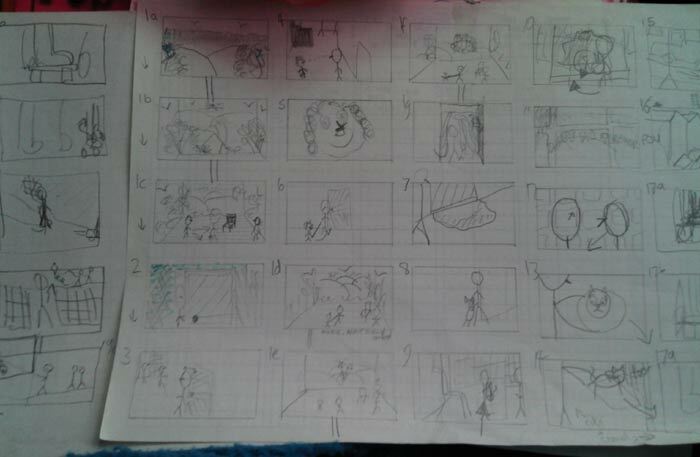 The film never got finished – we got chucked off location when the proprietors discovered vats of fake blood and prop guns, they weren’t sure what was going on! Comic Swaps! My friend Rob drew this picture of me once as a thanks for my blog helping him get over writers’ block – pretty much the only time anyone had done that! It’s dead good! 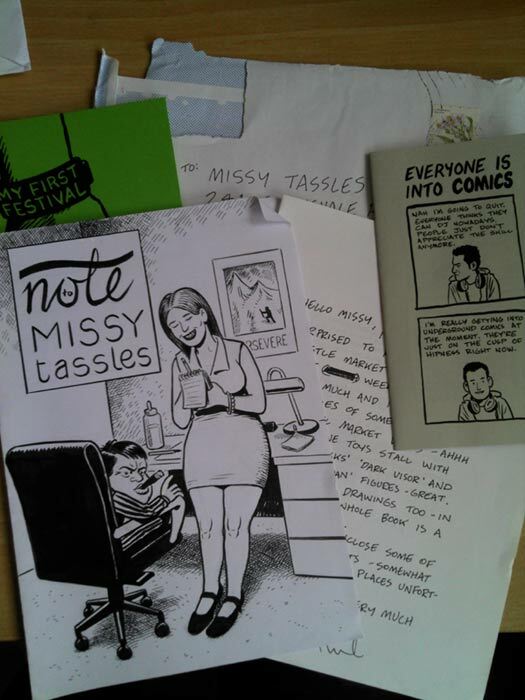 A lovely man called Philip Barrett sent me a bunch of his comics too, after one of my friends (either Jim or Anjan) sent him a copy of one of my comics. His stuff is really good. 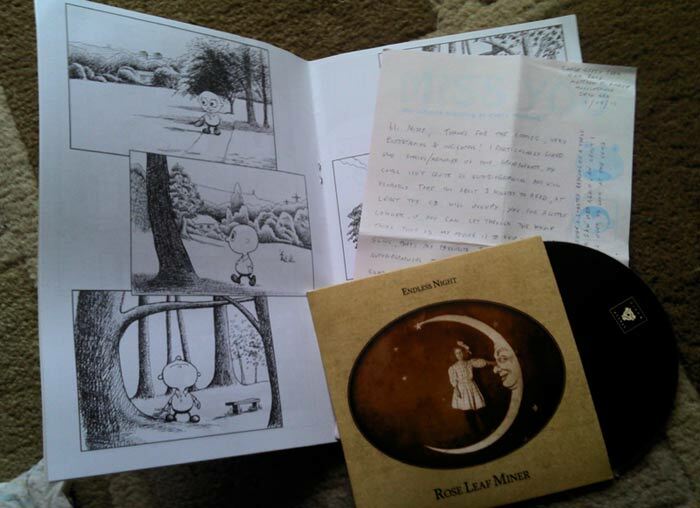 And I sent some comics to my friend Paul a year or two ago also, who in return kindly sent me one of his and a copy of his Rose Leaf Miner cd. It’s really good, you should listen to it!